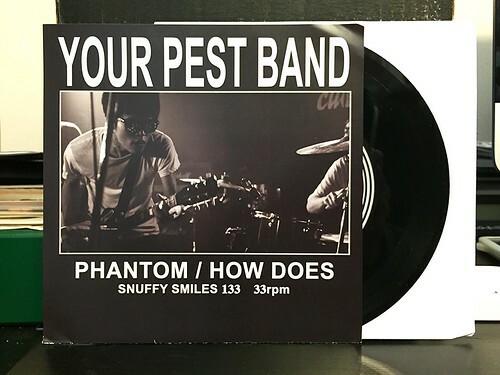 I Buy Way Too Many Records Dot Com: Your Pest Band / The Invisible Teardrops - Split 7"
Your Pest Band / The Invisible Teardrops - Split 7"
This split is another in the never ending stream of Snuffy Smiles split 7"s that have been coming out of Japan for over 20 years. These days, I think you can safely say that Your Pest Band are the standard bearers of Snuffy Smiles. They are insanely prolific and have constantly been putting out new records, but their home base has always been Snuffy Smiles. The two Your Pest Band songs continue their descent into a spaced out mix of traditional Japanese pop punk and a more melodic, garagey sound. There's a little echo going on in the vocals and the guitar riffs will get stuck in your head for days. No matter what Your Pest Band releases, it's always deeply rooted in a catchy, if not sometimes warped, pop hook. Both songs on their side of the split are perfect additions to their rapidly expanding catalog. On the flip side is a band called The Invisible Teardrops. Prior to getting this 7", I had never heard of them. I find it fascinating that Yoichi from Snuffy Smiles always manages to get his hands on relatively unknown bands from America before the rest of the world catches on. On "Shiver," The Invisible Teardrops ease through a nice mid tempo pop song with a tiny bit of twang, reverb tinged vocals and a little keyboard. Definitely the highlight of their side of this record. The second song "Shoaly" is a bit slower, but still pretty good. You'll need to be patient though as there's a reasonably long intro/drum thing that seems like an odd way to start off a song to me. Definitely better than yesterday's split, you really need this 7" for the Your Pest Band songs. The Invisible Teardrops are just a nice bonus. As usual, you can't really find anywhere to stream Snuffy Smiles releases, but this is worth going out of your way to pick up.